John E. Vander Stelt is a native of Maurice, Iowa and it is there where he seeks the inspiration for his work. Vander Stelt takes a traditional approach to the realism which pervades his subjects. John studied art from an early age and comes from a family with a creative spirit. 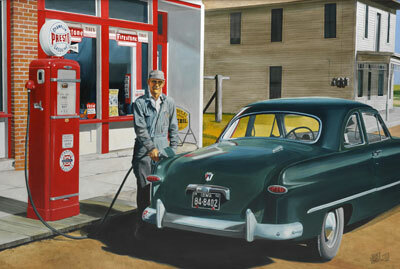 The artist's friends, family and small-town Iowa surroundings are often crucial elements in his work. He graduated from Northwestern College in Orange City, Iowa with a degree in fine art. His artwork is included in public and private collections throughout the country.